Choose the Location you want to plant in. Choose Your Plant based on the environmental conditions of your location. Wire Baskets : Dig your hole the depth of the wire basket if in good soil conditions and 12-18 in. wider than the diameter of the wire basket. Potted Plants : Dig your hole the depth of the pot if in good soil conditions and 1-2 times wider than the diameter of the root ball. TIP : To prevent settling, be sure soil beneath root ball is undisturbed or has been compacted. Most plants should be sitting on soil, not clay. If planting in a high clay area, create a drainage ring by digging the hole a minimum of 6-18 in. deeper leaving a centre mound of clay (A) to lift the plant, backfill the remaining area with high-quality soil and tap down to allow for better drainage. 1. 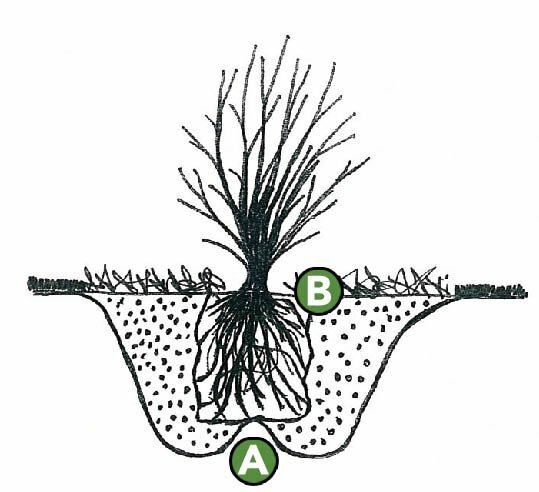 Measure Your Hole to ensure the plant will be level with the final grade (B). 2. If Your Hole is Too Deep, backfill with high-quality soil (C) and tap down. Wire Baskets : Do not remove the basket. Potted Plants : Gently squeeze your pot to help remove the root ball from the pot. Make sure there are no circulating roots. Gently massage the roots to allow them to root faster. TIP : If there are a few circulating roots, cut vertically into the root ball about 1 in. deep in five different places. If it has a lot of circulating roots, cut one inch of roots off to allow new root growth to branch out of the circle pattern. 2. If Using Myke, ensure it makes contact with the root area. TIP : For potted plants, rub Myke evenly over the rootball surface. For heavier plants and wire baskets, the Myke can be spread evenly across the sides and bottom of the hole. 3. Place Your Plant in the hole. Wire Baskets : Once placed, remove the string, bend down or remove the wire ears with bolt cutters to below the surface and remove the burlap from the top of the root ball. 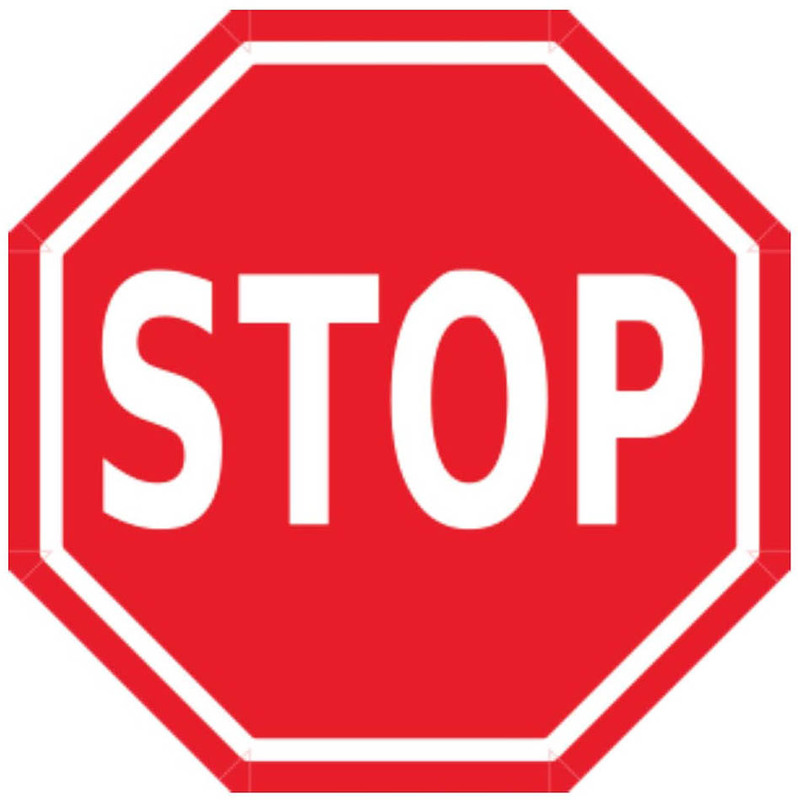 Potted Plants : Position your plant to make sure it is straight and level with final grade. 4. Backfill the first half of the hole with a high-quality topsoil or a good compost (D) and tap down. Continue to backfill the remainder of the hole and tap down until level with final grade. 1. Water the plant thoroughly, this will let the soil settle and the air to bubble out. You may need to top up your soil and tap down again. 2. If Not Using Myke, you can fertilize with a high middle number (ex: 10-52-10) at this time. Follow the package instructions for 2-3 years. TIP : Do not fertilize after August 1st. Fertilizing too late in the season disrupts the tree’s ability to go dormant prior to freeze up. 3. Prune Off Branches that may have been damaged during transportation or planting. 4. 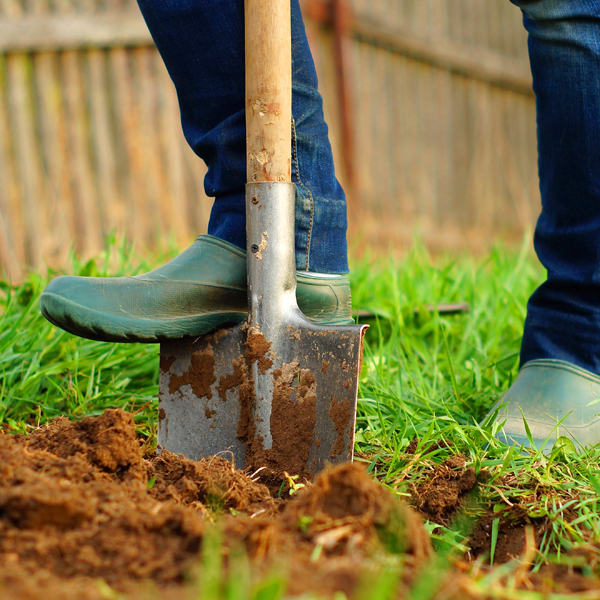 Stake Your Plant if planting a tall, top-heavy plant or a tree in a windy location. 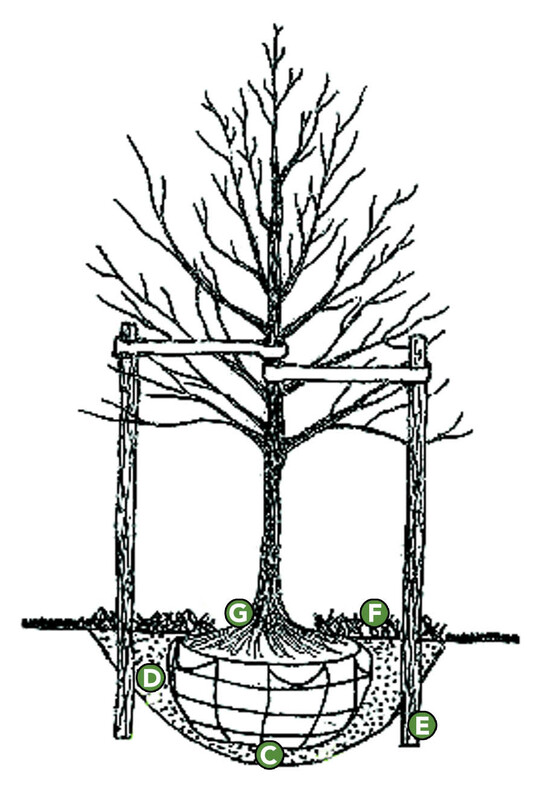 Place stakes into undisturbed soil (E) for support. TIP : Never allow ties to cut off circulation or cut into a tree. Do not stake a tree for more than 2 yrs. 5. Mulch Your Plant after soil has settled level with final grade (this can take a few days) to increase the moisture retaining capacity of the soil. Mulch should extend 2 to 4 ft. (F) away from the plant flare (G). Mulch at the flare should be less than 1 in. deep. TIP : If the plant becomes too wet, rake the mulch off the root ball to allow it to dry out faster. Never put filter fabric directly over a root ball. TIP : Water plants daily while still in pots. No Two Plants are the Same. How much water your plant needs will vary based on the type of plant, size of plant, weather conditions, location, etc. Your plant will wilt if it is too wet or too dry, so it is important to check the soil before watering. Newly Planted Plants benefit from deep soaking during the first year to encourage deep root production: Turn the hose on low, place it close to the base of the plant and allow water to soak into the root area over an extended period of time (5 to 20 minutes depending on size). Let the surface dry completely before watering again. To Determine Your Plant’s Water Needs, carefully check the moisture level up to 12 in. down, just outside the root ball. If the soil is crumbly, it is time to water. If it feels wet and muddy, give your plant more time to dry out before watering again. TIP : It is important to water your plants just before the ground freezes; even established plants. Some Trees Attract Animals in fall and winter. Many animals seek out tender tree bark during winter months as a source of food. This is especially true for fruit trees and sweet woods. Damage from animals can lead to the death of your tree. Wrap the trunk with a plastic or metal tree wrap to protect it over the winter months and remove in spring. Do Not leave your plant’s roots exposed to the sun. Do Not plant other plants over top of the plant’s roots, this includes grass/sod and flowers. Do Not put filter fabric over the plant’s root ball. Do Not let your plant sit in water or overwater it. Do Not pile mulch around the base of the plant. Do Not fertilize after August 1st. If You Think Something is Wrong, Contact Us. We are here to help ensure your plant’s success. Take pictures so we can see what is going on. It is best to provide a couple close ups of the problem areas as well as an overall view so we can see the plant’s environment. Do not bring your plants back.